Catching a Lappet-faced Vulture is always a struggle. At a typical large carcass you often find that these red-headed birds are outnumbered by their smaller white-backed cousins, sometimes with a single Lappet-faced Vulture trying to fight for a scrap of wildebeest meat with over 50 African White-backed Vultures. This makes capturing one a rare event. You can improve your odds by focusing on small carcasses or putting the trap near the head of the carcass (a favorite area for these strong, large-beaked scavengers), but even then you just have to get lucky. On April 25, I got lucky. We managed to trap a beautiful adult Lappet-faced Vulture and named her Lolly. As we attached the GSM-GPS transmitter, which would allow us to follow the bird for the next year, I couldn’t help but run my fingers through the soft, white downy feathers that covered the bird’s chest and admire the long feathered eyelashes and beard that adorned Lolly’s face. After our work was done, the bird took off quickly and was soon back to doing what it does best – searching for its next meal. By eating dead animals, this Lappet would play a vital role, protecting the Masai Mara ecosystem from disease and waste. In the afternoon we started following Lolly’s movements and within days we had found its nest. The bird was a hard-working parent and spent whole days at the nest, only leaving every two to three days to look for food, trusting its mate to feed it in the meantime. It was early in the season, but given the bird’s hunched posture over the large bramble of twigs, it was likely that it had an egg. For almost a month, I watched cheerily as Lolly moved from nest to foraging area, often venturing north of the reserve’s border in search of food. Then something unusual happened. On May 24, exactly one month after I had deployed the unit, Lolly stopped moving. At first I tried not to worry, but then we got the call. Lolly had been found dead – yet another victim of poison. The body was recovered between Narok and Sekenani gate, not too far from Maji Moto and upon further discussion with the local Masai villagers, we learned that an insecticide called Doom had been spread over the corpse of a sheep that had been attacked by a hyena. When the hyena came back to feed it was quickly killed. When two jackals, two Lappet-faced Vultures (including my Lolly) and an African White-backed Vulture came to clean up the remains, they died almost instantly. Upon investigating the scene, Tony Binks and Justin Heath found the gruesome remains of the scavengers, who had only been trying to do their job. The feet and crop of the birds were collected to confirm the poisoning and the bodies burned, but the damage was already done. Sadly the death toll would go beyond the individuals here and extend to the eggs and chicks that relied on them. From now on, Lolly’s nest would be empty. Lolly marked the third tagged bird of just 17 individuals who had died from poisoning in the last year. If this mortality rate is at all indicative of population-wide levels, it would mean a nearly 20% annual decline in vultures from poisoning alone. No matter how common vultures might seem, no species can suffer such losses for long. 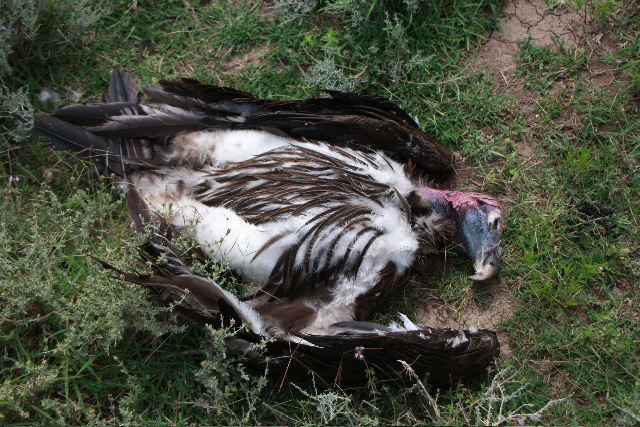 Indeed, unchecked, poisoning could cause the rapid extinction of not one but six vulture species found in the Mara-Serengeti ecosystem. 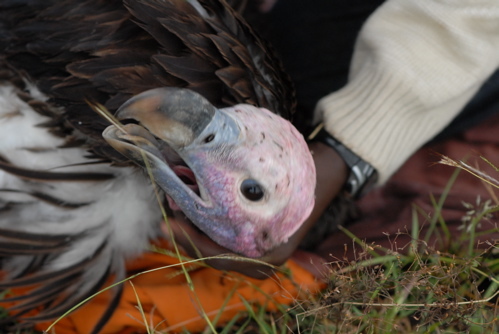 With the GSM-GPS transmitters we can gain valuable information on how often poisoning is happening and where it occurs, but in the end the vultures will only be saved when people recognize the destruction they are causing and stop poisoning.